Voltek was founded to meet the growing need for certified H/EV service and repair. All of our technicians are ASE certified and have gone through extensive hands-on training. We offer full service on all makes and models of H/EV's. We also sell certified used H/EV's and rebuild H/EV's that were sold to auto recyclers because the battery pack failed or were in an accident. Voltek is positioning itself to become the leader in H/EV service, repair, and sales in Michigan and beyond. It is our goal to make H/EV ownership practical and affordable for all. We sincerely believe that H/EV's are good for our country, economy, and the world. We want to help make the transition from petroleum to renewables as quick and painless as possible. It is an unfortunate fact that the people who would be most helped by driving an H/EV cannot afford them. If we want to make this switch happen we need to focus on making H/EV's available to everyone; that's where Voltek comes in. By offering service at an affordable price and rebuilding existing H/EV's, we can make buying and owning these vehicles more affordable. 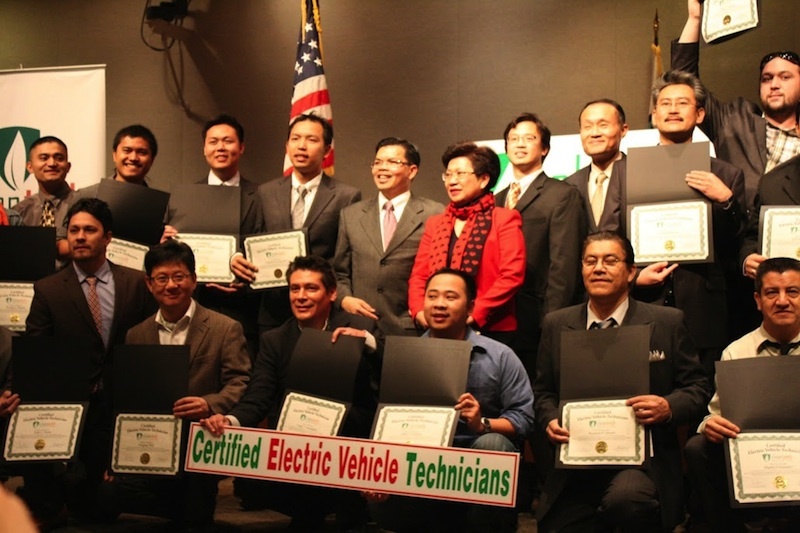 CleanTech Institute's Certified Electric Vehicle Technician Graduation ceremony in Orange County, California 2012. Jordan Brandt was the youngest technician in the class at 25 years old (pictured in the top right).